A great deal of information about the culture of Busongora became accessible in 2015, thanks to a UNESCO-sponsored documentation project. UNESCO's project partners were Busongora Kingdom and the Uganda Ministry of Gender, Labour and Social Services. The project lasted two years, and involved a UNESCO-trained team of 12 Basongora, who tasked to do field research, inventorying, analysis and translation of the various elements that constitute the endangered culture of the Basongora. 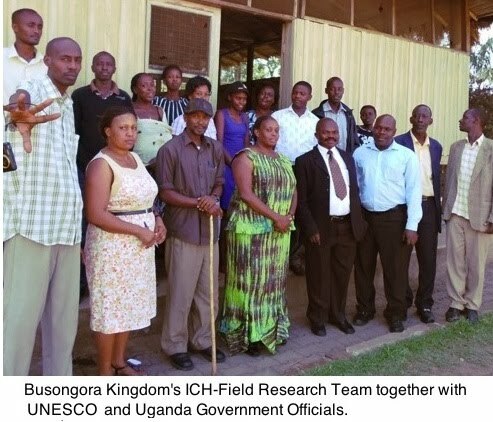 The UNESCO team of Basongora field-researchers included: Mulindwa David, Zachariah Kababa Kyibiro, Lydia Karungi, Anna Bumbulika, Daphne Mugyema, Annette Kiboneka, Steven Mbera, Ntonde Monica, Njura Edward, Josam Nyamutale, Prince Kennedy Bwebale, Elfazi Rutahaba, and King Ndahura II Imara Kashagama. Hundreds of helpful Basongora informants and culture bearers were consulted during the course of the UNESCO project and included: Yombo Kasonsoleko Yowasi, Gladys Ikurato [Prophetess], Hon. Samuel Ntungwa, King Rwigi IV Bwebale Rutakirwa, Grace Sangara, Beatrice Monday Kazini, James Icunga Bwebale, Beatrice Nzomba, Beatice Mukwengye, Joyce Myogo, Eric Kafuda, Christopher Monday Kazini, Edward Kyabazinga, Glady Ikurata, Gladys Duha, Isiimbwa Yona Kaheru, Kitaka Rutaizibwa. 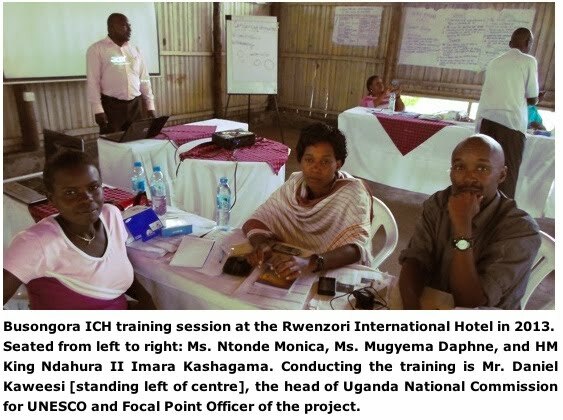 The Basongora ICH research team and culture bearers were facilitated and trained by officials of Uganda's Ministry of Gender, Labour and Social Development, and by UNESCO. Ms. Jane Sanyu Mpagi was responsible for overall Policy Guidance. The National Coordinator for the Project Management Committee was led by Ms. Naumo Juliana, Commissioner for Culture and Family Affairs. The Project management Committee included Ms. Eunice Tumwebaze [Assistant Commissioner for Gender and Culture] and Ms. Ruth Muguta of the Ministry of Gender. Other project leaders were Mr. Daniel Kaweesi, head of the Uganda National Commission for UNESCO and Focal Point Officer of the project; Mr. Saidi Twine of National Curriculum Development Centre; Mr. Abiti Nelson and Mr. Asiimwe Richard of the Ministry of Tourism, Wildlife and Antiquities; and Mr. Eliot Arinaitwe of Ministry of Education and Sports. The district authorities were also represented, and included the vice chair of the LCV [Local Council 5], the District Cultural Officer for Bushenyi District, and Ms. Queengonda Asiimwe [District Cultural Officer for Kasese District]. The government team members providing technical guidance and reviewed the final drafts of the inventories. The resources associated with many of the traditional practices of the Busongora are available but are hard to access, on account of restrictions against using the national parks, and also because of the disorder caused by land conflict. Moreover, invasive species such as lantana camara have replaced many other species of plants. Its hard to locate wild herbs and grasses used in enacting “kuhunda” and “kutona” because they are becoming extinct in many locations. Increasingly Basongora have to resort to using plastic beads and pendants, as well as plastic string and other industrial products such as paints, instead of the traditional organic pigments and materials such as sisal and elephant-nails [these fall off the elephant on their own accord and are picked up by Basongora - the elephants are not harmed]. Yet there is still hope for the survival of the traditions of the Basongora. Many marriage ceremonies now require the presentation of traditional gifts such as emigamba [carrying yokes] that are highly decorated using traditional methods. A well decorated mugamba loaded with milkpots and other custom items, may cost more than a million Uganda shillings [about 500$ US]. Kuruka Amabara -which includes “Kwambika” - deals with the rites and procedures used in the naming of children, as well as the ritual of “Honour Names” - known as “eNgundu” and “eNyana” among Basongora, but conventionally referred to a “empaako” among communities neighbouring the Basongora. It is interesting that these Basongora “Honour Names” are also the names of ancient Kushite, Egyptian and Canaanite gods and constellations. Rusaka and other Basongora games - rusaka is a string game, but Basongora also play Olwango [a variant of chess/mancala]. Many games may have originated from rites used in ancient times and still have significance as a means of transmitting social values. Kwetonda - deals with the recounting of elaborate genealogical records during public performances and also in the formal greetings between people. Although the list is not exhaustive, it is certain that the field researchers who were trained to investigate and document Basongora culture in 2014 will continue to do even though the pilot program has ended. Moreover, the history or Busongora, as well as the decorative and ideographic systems used by the ancient Basongora, have drawn attention and interests of linguists and researchers and cultural organizations, thanks to UNESCO, and the efforts of cultural institution of Busongora Kingdom. Basongora have also benefited from the creation of the Igongo Museum in Mbarara. Although it is outside Busongora, the Igongo museum displays the artefacts of the cultural groups found in the region of western Uganda that share some similarities with Basongora. As well, the Basongora are benefiting from publications done by one of Africa’s leading publishers - Fountain Press - and from publications by the Cross Cultural Foundation of Uganda. At least one booklet showcasing the decorative designs of the Bahuma/bachwezi, which originated in Busongora, are on display at Igongo and is available for sale. NB: On Sat. 14 May 2016, HM the King Ndahura II assented to the resolution of the Council of Ministers of Busongora Kingdom to launch a new program for the documentation of the Intangible Cultural Heritage of Busongora. The new ICH project will complement the UNESCO ICH project that was completed in 2015.